OK this seems to be a pretty awesome offer from the nice people at Wondershare who make the Filmora video editor. 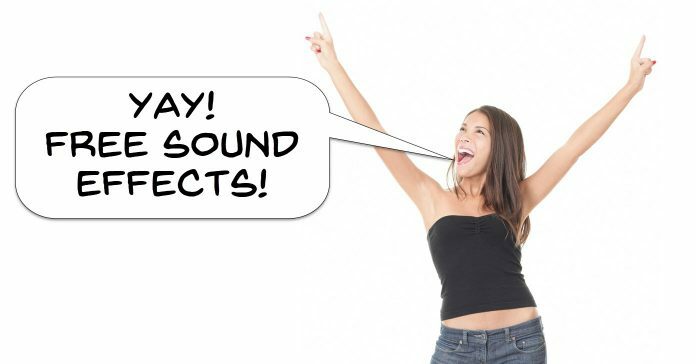 They are offering a huge collection of free sound effects that can be used in any video editor in exchange for… nothing! I kind of figured they would at least be trying to get an email address for it or perhaps restrict it to only Filmora users but no! I have been to the page myself and downloaded with no problems at all. That one actually causes you to download the Filmora video editor PLUS the sound effects package. If you want to check out Filmora then sure, go for it. If not just click the smaller button below it that says, “I already have Filmora” and the download will begin. Now if you don’t have Filmora then It’s probably OK to tell a little white lie there! The download comes as a zip file which you can then extract to whatever folder on your computer you want. Somewhere else around here this week there is another video tutorial on the subject of getting organized before you start editing. In fact this is a lesson I personally learned the hard way a while back now. Up until a particular project I was working on I had been making videos that were really quite simple in their structure and were essentially short video montages set to some music. Then came that fateful day when I embarked on a larger project that involved video from different cams, voice over audio as well as music, some sound effects,images and a bunch of other slightly more specialized sequences within it. From memory I figure it took me about two hours to become so totally lost within all my own assets and so frustrated at being unable to identify just about anything in my libraries that I has to give up and start over. Luckily for me I have a close friend who was a pro editor at that time and his advice to me (after the laughing subsided) was to get organized THEN start editing. I still do it today and it can be a life saver. OK I know that with the addition if this video tutorial on getting organized before you start editing it may seem that I am laboring the point a little! Believe me when I say it it just pure coincidence that I happened upon two videos this week on the same subject! Interestingly both of the creators of the videos fully acknowledge the same obvious point. That is that getting yourself and all of your project assets organized into some kind of coherent whole is both vital to your sanity and just about the most boring thing to do as part of a project! Anyway I wanted to include both of them because although they are covering the exact same subject, they are slightly different in their approach. If you want to stay sane while you are editing a project you really need to get organized first BUT, how you get organized is entirely up to what makes sense to you. Filmora releases update to their existing screen recorder and CyberLink spin off their screen recorder from PowerDirector into a standalone product with enhancements. That’s just a ridiculously long sentence let alone title for a blog entry! For about a year now Filmora have offered a standalone screen recorder called Filmora Scrn. I am not sure that just taking out the vowels from a word and using it as a product name is all that inspiring but hey, that’s what they went with! So this week they released an update to the program adding a few new features which you can see in the video below. Meanwhile back at CyberLink they have just released their own standalone screen recorder as a separate product. Now both Filmora and CyberLink have included a screen recorder as a free add-on to their video editing software offerings for a few years now. The reason they have both now created separate products has mainly been due to changing consumer demands. These days more and more people are wanting to use screen recorders but do not necessarily want to buy a full “bells and whistles” video editing suite just to get a good one. Hence Filmora Scrn and CyberLink Screen Recorder 3. Both offer basic editing features for when you have finished recording and both also offer greater flexibility and features as far as the recording process goes as well. There is a particular style of tutorial that I am always on the lookout for and it is the type that easily breaks down one point of professional production. Most people producing video at the amateur or home user level are generally well aware that there is a world of difference between what they are producing and what the pro’s are doing. Obviously this comes down to a wide range of factors so for the amateur it can be a tad overwhelming when you go to a pro website and start to look around for tips. Nearly everything on those sites assumes some kind of prior knowledge or experience and it usually doesn’t take too long before you get lost in it all. So, my experience in this has been to isolate some basics then work on those until they are naturally part of your shooting or editing routine. The video below is one of those. It is simply taking the concept of shooting video and adding one particular type of shot to your repertoire explaining why it works and how to use it. Well it seems that at least once per week I come across a tutorial on shooting videos with your smart phone and the video below is of course no exception. I do however like to keep including them because these days you can capture some excellent quality footage on a phone and it really only takes a few little points to keep in mind to maximize that quality. OK any day now I am probably going to have to bite the bullet and start getting into the world of 360 video. To be honest I had secretly hoped that it would all fall over and go the way of the Dodo before this but sadly it seems to be here and here to stay. In the meantime other people are producing excellent tutorials on the subject so for the moment I am happy to sit back and let them have at it. This is a pretty straightforward tutorial on using the opacity of an overlay to create a simple “ghost” effect.